George was born in the city of Hanover in Germany, and was the son of George Louis, Hereditary Prince of Brunswick-Lüneburg (later King George I of Great Britain), and his wife, Sophia Dorothea of Celle. Both of George’s parents committed adultery, and in 1694 their marriage was dissolved on the pretext that Sophia had abandoned her husband. She was confined to Ahlden House and denied access to her two children, George and his sister Sophia Dorothea of Hanover, who probably never saw their mother again. George spoke only French, the language of diplomacy and the court, until the age of four, after which he was taught German by one of his tutors, Johann Hilmar Holstein. In addition to French and German, he was also schooled in English and Italian, and studied genealogy, military history and battle tactics with particular diligence. George’s second cousin once removed, Queen Anne, ascended the thrones of England, Scotland and Ireland in 1702. She had no surviving children, and by the Act of Settlement 1701 the English Parliament designated Anne’s closest Protestant blood relations, George’s grandmother Sophia and her descendants, as Anne’s heirs in England and Ireland. Consequently, after his grandmother and father, George was third in line to succeed Anne in two of her three realms. He was naturalized as an English subject in 1705 by the Sophia Naturalization Act, and in 1706 he was made a Knight of the Garter and created Duke and Marquess of Cambridge, Earl of Milford Haven, Viscount Northallerton and Baron Tewkesbury in the Peerage of England. England and Scotland united in 1707 to form the Kingdom of Great Britain, and jointly accepted the succession as laid down by the English Act of Settlement. George’s father did not want his son to enter into a loveless arranged marriage as he had, and wanted him to have the opportunity of meeting his bride before any formal arrangements were made. Negotiations from 1702 for the hand of Princess Hedvig Sophia of Sweden, Dowager Duchess and regent of Holstein-Gottorp, came to nothing. In June 1705, under the false name of “Monsieur de Busch”, George visited the Ansbach court at their summer residence in Triesdorf to investigate incognito a marriage prospect: Caroline of Ansbach, the former ward of his aunt Queen Sophia Charlotte of Prussia. The English envoy to Hanover, Edmund Poley, reported that George was so taken by “the good character he had of her that he would not think of anybody else”. A marriage contract was concluded by the end of July. On 22 August / 2 September 1705O.S./N.S. Caroline arrived in Hanover for her wedding, which was held the same evening in the chapel at Herrenhausen. George was keen to participate in the war against France in Flanders, but his father refused permission for him to join the army in an active role until he had a son and heir. In early 1707, George’s hopes were fulfilled when Caroline gave birth to a son, Frederick. In July, Caroline fell seriously ill with smallpox, and George caught the infection after staying by her side devotedly during her illness. They both recovered. In 1708, George participated in the Battle of Oudenarde in the vanguard of the Hanoverian cavalry; his horse and a colonel immediately beside him were killed, but George survived unharmed. The British commander, Marlborough, wrote that George “distinguished himself extremely, charging at the head of and animating by his example [the Hanoverian] troops, who played a good part in this happy victory”. Between 1709 and 1713, George and Caroline had three more children, all girls: Anne, Amelia, and Caroline. By 1714, Queen Anne’s health had declined, and British Whigs, politicians who supported the Hanoverian succession, thought it prudent for one of the Hanoverians to live in England, to safeguard the Protestant succession on Anne’s death. As George was a peer of the realm (as Duke of Cambridge), it was suggested that he be summoned to Parliament to sit in the House of Lords. Both Anne and George’s father refused to support the plan, although George, Caroline and Sophia were all in favour. George did not go. Within the year, both Sophia and Anne were dead, and George’s father was king. George and his father sailed for England from The Hague on 16/27 September 1714 and arrived at Greenwich two days later. The following day, they formally entered London in a ceremonial procession. George was given the title of Prince of Wales. Caroline followed her husband to Britain in October with their daughters, while Frederick remained in Hanover to be brought up by private tutors. London was like nothing George had seen before: it was 50 times larger than Hanover,A and the crowd was estimated at up to one and a half million spectators. George courted popularity with voluble expressions of praise for the English, and claimed that he had no drop of blood that was not English. In July 1716, the king returned to Hanover for six months, and George was given limited powers, as “Guardian and Lieutenant of the Realm”, to govern in his father’s absence. He made a royal progress through Chichester, Havant, Portsmouth and Guildford in southern England. Spectators were allowed to see him dine in public at Hampton Court Palace. An attempt on his life at Drury Lane Theatre, in which one person was shot dead before the assailant was brought under control, boosted his high public profile. His father distrusted or was jealous of George’s popularity, which contributed to the development of a poor relationship between them. 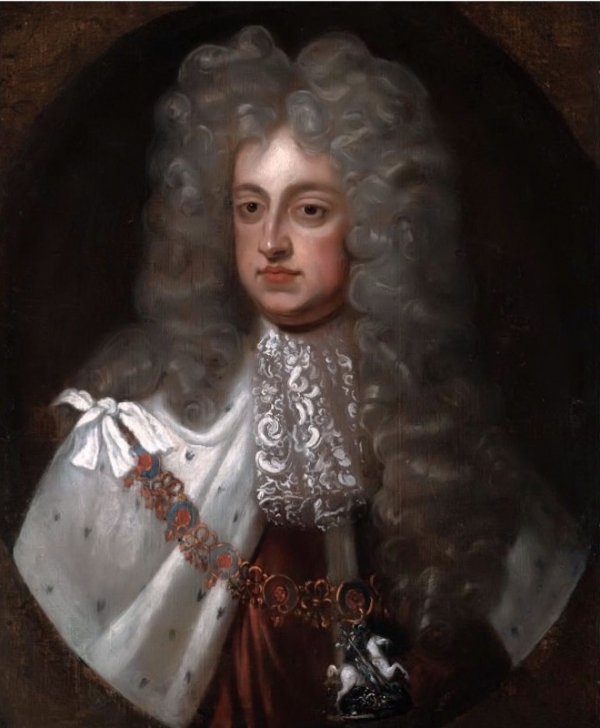 The birth in 1717 of George’s second son, Prince George William, proved to be a catalyst for a family quarrel; the king, supposedly following custom, appointed the Lord Chamberlain, the Duke of Newcastle, as one of the baptismal sponsors of the child. The king was angered when George, who disliked Newcastle, verbally insulted the duke at the christening, which the duke misunderstood as a challenge to a duel.B George and Caroline were temporarily confined to their apartments on the order of the king, who subsequently banished his son from St James’s Palace, the king’s residence. The Prince and Princess of Wales left court, but their children remained in the care of the king. George and Caroline missed their children, and were desperate to see them. On one occasion they secretly visited the palace without the approval of the king; Caroline fainted and George “cried like a child”. The king partially relented and permitted them to visit once a week, though he later allowed Caroline unconditional access. The following February, George William died, with his father by his side. 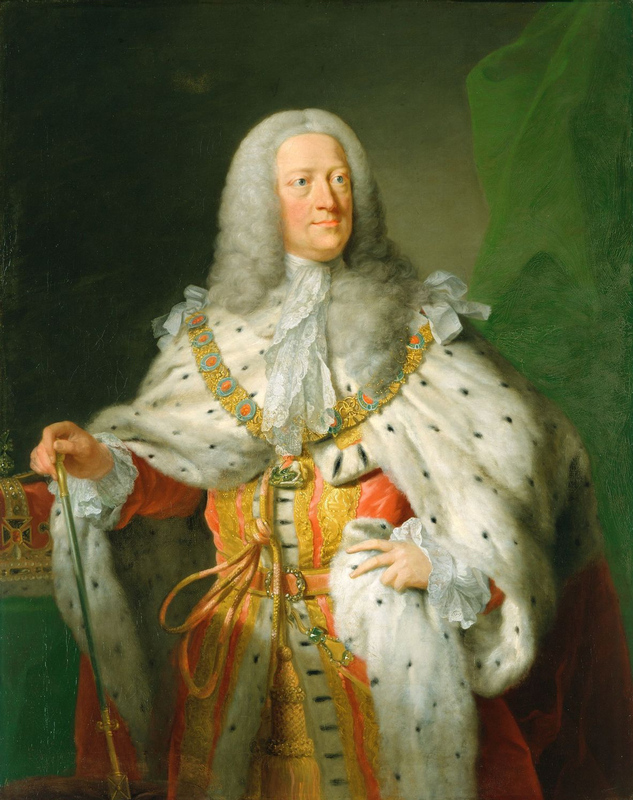 George I died on 11/22 June 1727 during one of his visits to Hanover, and George II succeeded him as king and elector at the age of 43. The new king decided not to travel to Germany for his father’s funeral, which far from bringing criticism led to praise from the English who considered it proof of his fondness for England. He suppressed his father’s will because it attempted to split the Hanoverian succession between George II’s future grandsons rather than vest all the domains (both in Britain and Hanover) in a single person. Both British and Hanoverian ministers considered the will unlawful, as George I did not have the legal power to determine the succession personally. Critics supposed that George II hid the will to avoid paying out his father’s legacies. George II was crowned at Westminster Abbey on 11/22 October 1727. The composer George Frideric Handel was commissioned to write four new anthems for the coronation, including Zadok the Priest. It was widely believed that George would dismiss Walpole, who had distressed him by joining his father’s government, and replace him with Sir Spencer Compton. George asked Compton, rather than Walpole, to write his first speech as king for him, but Compton asked Walpole to draft it. Caroline advised George to retain Walpole, who continued to gain royal favour by securing a generous civil list (a fixed annual amount set by Parliament for the king’s official expenditure) of £800,000. Walpole commanded a substantial majority in Parliament and George had little choice but to retain him or risk ministerial instability. Compton was ennobled as Lord Wilmington the following year. Walpole directed domestic policy, and after the resignation of his brother-in-law Townshend in 1730 also controlled George’s foreign policy. Historians generally believe that George played an honorific role in Britain, and closely followed the advice of Walpole and senior ministers who made the major decisions. Although the king was eager for war in Europe, his ministers were more cautious. The Anglo-Spanish War was brought to an end, and George unsuccessfully pressed Walpole to join the War of the Polish Succession on the side of the German states. In April 1733, Walpole withdrew an unpopular excise bill that had gathered strong opposition, including from within his own party. George lent support to Walpole by dismissing the bill’s opponents from their court offices. George II’s relationship with his son and heir apparent, Frederick, Prince of Wales, worsened during the 1730s. Frederick had been left behind in Germany when his parents came to England, and they had not met for 14 years. In 1728, he was brought to England, and swiftly became a figurehead of the political opposition. 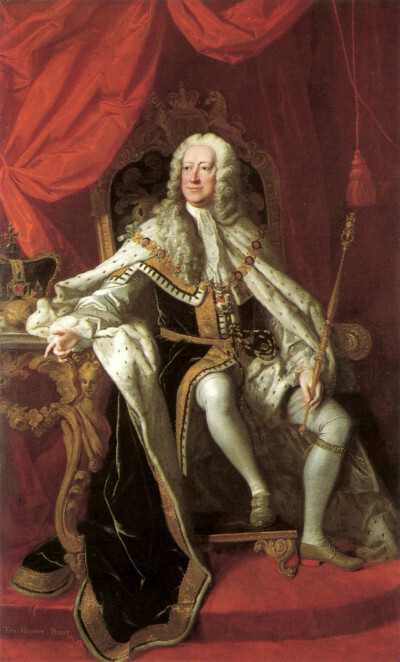 When George visited Hanover in the summers of 1729, 1732 and 1735, he left his wife to chair the regency council in Britain rather than his son. Meanwhile, rivalry between George II and his brother-in-law Frederick William I of Prussia led to tension along the Prussian–Hanoverian border, which eventually culminated in the mobilization of troops in the border zone and suggestions of a duel between the two kings. Negotiations for a marriage between the Prince of Wales and Frederick William’s daughter Wilhelmine dragged on for years but neither side would make the concessions demanded by the other, and the idea was shelved. Instead, the prince married Princess Augusta of Saxe-Gotha in April 1736. In May 1736, George returned to Hanover, which resulted in unpopularity in England; a satirical notice was even pinned to the gates of St James’s Palace decrying his absence. “Lost or strayed out of this house”, it read, “a man who has left a wife and six children on the parish.” The king made plans to return in the face of inclement December weather; when his ship was caught in a storm, gossip swept London that he had drowned. Eventually, in January 1737, he arrived back in England. 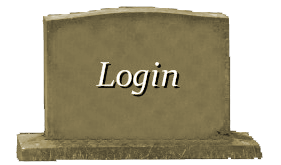 Immediately he fell ill, with piles and a fever, and withdrew to his bed. The Prince of Wales put it about that the king was dying, with the result that George insisted on getting up and attending a social event to disprove the gossip-mongers. When the Prince of Wales applied to Parliament for an increase in his allowance, an open quarrel broke out. The king, who had a reputation for meanness, offered a private settlement, which Frederick rejected. Parliament voted against the measure, but George reluctantly increased his son’s allowance on the advice of Walpole. Further friction between them followed when Frederick excluded the king and queen from the birth of his daughter in July 1737 by bundling his wife, who was in labour, into a coach and driving off in the middle of the night. George banished him and his family from the royal court, much like the punishment his own father had brought upon him with the exception that he allowed Frederick to retain custody of his children. Soon afterwards, George’s wife Caroline died on 20 November 1737 (O.S.). He was deeply affected by her death, and to the surprise of many displayed “a tenderness of which the world thought him before utterly incapable”. On her deathbed she told her sobbing husband to remarry, to which he replied, “Non, j’aurai des maîtresses!” (French for “No, I shall have mistresses!”). It was common knowledge that George had already had mistresses during his marriage, and he had kept Caroline informed about them. Henrietta Howard, later Countess of Suffolk, had moved to Hanover with her husband during the reign of Queen Anne, and she had been one of Caroline’s women of the bedchamber. She was his mistress from before the accession of George I until November 1734. She was followed by Amalie von Wallmoden, later Countess of Yarmouth, whose son, Johann Ludwig von Wallmoden, may have been fathered by George. Johann Ludwig was born while Amalie was still married to her husband, and George did not acknowledge him publicly as his own son. By October 1760, George II was blind in one eye, and hard of hearing. On the morning of 25 October, he rose as usual at 6:00 am, drank a cup of hot chocolate, and went to his close stool, alone. After a few minutes, his valet heard a loud crash. He entered the room to find the king on the floor. The king was lifted into his bed, and Princess Amelia was sent for, but before she reached him, he was dead. At the age of nearly 77, he had lived longer than any of his English predecessors. A post-mortem revealed that the right ventricle of the king’s heart had ruptured as the result of an incipient aortic aneurysm. George II was succeeded by his grandson George III, and was buried on 11 November in Westminster Abbey. 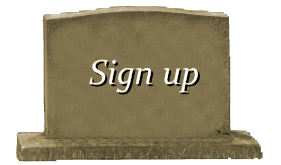 He left instructions for the sides of his and his wife’s coffins to be removed so that their remains could mingle.